This learning network provides free and fun educational content for the young and young at heart. Book reviews, author interviews and bios, industry news, and more related to children’s and young adult books. This United States National Library of Medicine site helps kids learn about household chemical hazards. Primary sources on the experiences of African and African-American slaves in the American colonies and United States. The National Park Service provides this collection of resources for teaching geology. Resources for teaching about the Arctic and Antarctic by integrating inquiry-based science with literacy instruction. 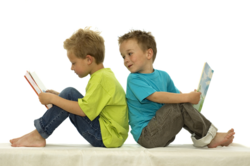 Videos, slideshows, and other tools for teaching reading to K-5 ELL. Toddlers develop their imaginations while discovering nature and animals. Games, stories, and pictures for learning about U.S. National Parks. Age-appropriate activities for children in kindergarten through grade 5. Links to resources for primary and intermediate math. Videos, images, and audio files on a range of science topics. Give your brain a workout with puzzles, math problems, pattern exercises, and more.